Legislation to impose a price cap on domestic energy bills was introduced into Parliament on 26 February 2018. The accompanying announcements from the Department for Business, Energy and Industrial Strategy (BEIS) indicate that the new regime will be in place by Winter 2018-19. This may feel like the end of a long story, and in a sense it is, but it is also the beginning of a new phase for GB retail energy markets: one in which, for the first time in many years, price regulation is likely to play a significant role in shaping the domestic energy supply market – albeit on an explicitly temporary basis. 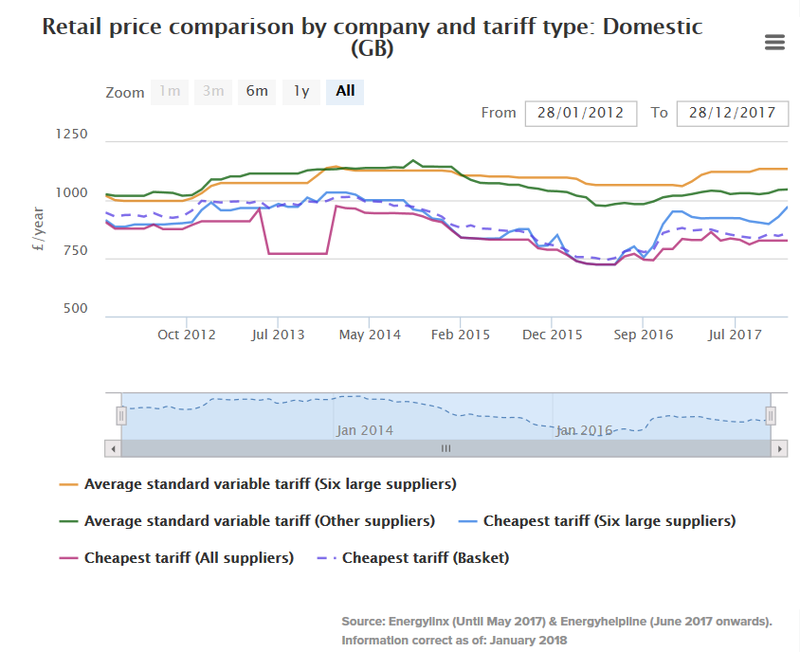 Theresa May singled out energy companies who “punish loyalty with higher prices” in her Conservative Party conference speech in October 2017, and a draft of the Domestic Gas and Electricity (Tariff Cap) Bill was published shortly afterwards. The House of Commons Select Committee that scrutinises the work of BEIS then examined the draft Bill, and produced a broadly favourable report on it in January 2018 (both the Committee’s report and the feedback on the draft Bill that they gathered from a range of stakeholders can be found here). Going further back, the Bill represents unfinished business from the Competition and Markets Authority (CMA) investigation of the GB energy supply markets that concluded in 2016. The instigation of that investigation by the sector regulator, the Gas and Electricity Markets Authority (Ofgem), almost four years ago, was itself the culmination of years of public debate about energy prices and the allegedly excessive profits made by GB utilities. The CMA found “an overarching feature of weak [domestic] customer response which, in turn, gives suppliers a position of unilateral market power concerning their inactive customer base which they are able to exploit through their pricing policies or otherwise”. 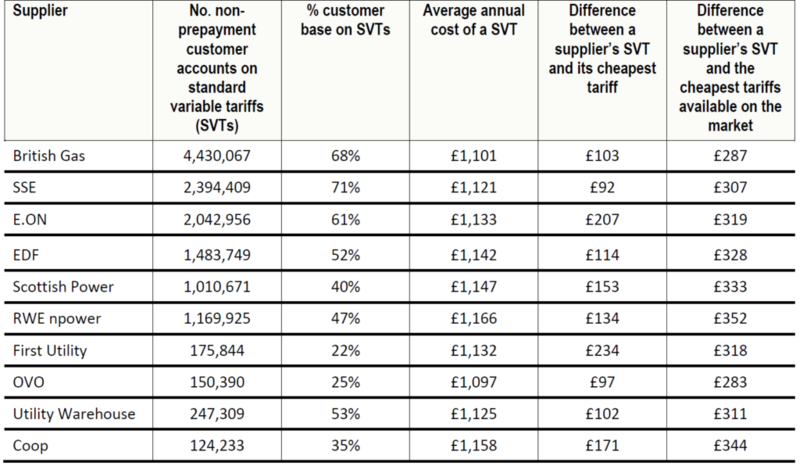 In particular, huge numbers of customers of the “Big 6” suppliers who showed little interest in or awareness of the possibility of shopping around for a better deal, found themselves on high “standard variable tariffs” (SVTs). As a result, the CMA identified “customer detriment associated with high prices” of “about £1.4 billion a year on average for the period 2012 to 2015 with an upwards trend”. However, the CMA panel that conducted the investigation decided (by a 4:1 majority) not to impose a price cap to address the harm to SVT customers generally – although they did decide in favour of a price cap for customers supplied through a prepayment meter (PPM). For others, the majority of the panel concluded that measures designed to increase the chances of those on SVTs signing up for a better deal were enough. The CMA’s conclusions failed to satisfy the public and political appetite for dramatic regulatory action. 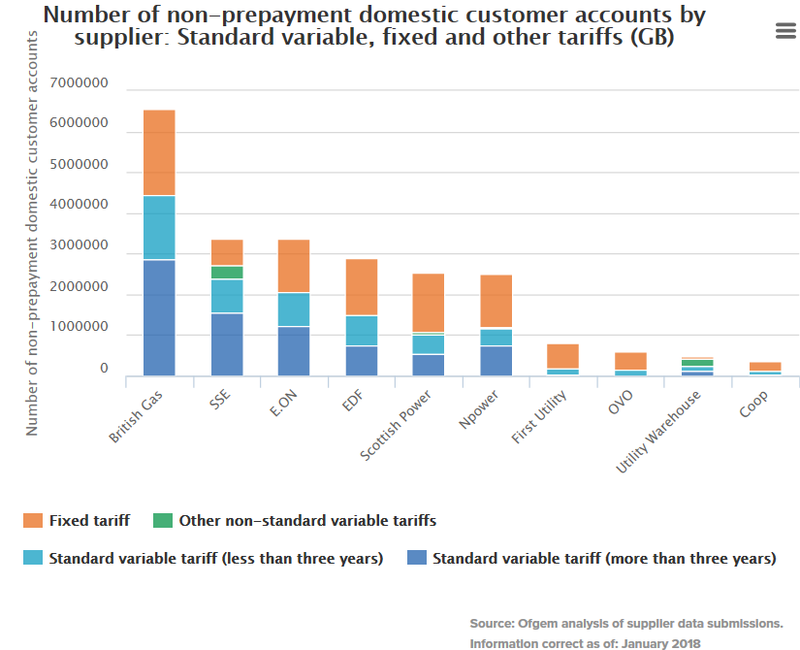 This was partly because in the period following the CMA’s report, average Big 6 SVTs showed little or no sign of decreasing, while their cheapest tariffs seemed to be increasing, and partly because many of those on high SVTs were also economically or digitally disadvantaged. Poorer customers appeared to be subsidising offers of more competitive prices to the more affluent – or perhaps the larger suppliers were just not very efficient. As the impact assessment published alongside the Bill (a more vigorous and forcefully expressed document than many of its kind) puts it: “a majority of people lose out, with disproportionate impact on the vulnerable”. These – and other, more overtly political reasons – made the move towards a cap unstoppable, notwithstanding the counter-argument that protecting those who didn’t shop around would be likely to result in higher prices for those who did, undermining the development of a properly competitive supply market in the longer term. Interestingly, during the course of the Select Committee’s inquiry, more industry voices than might previously have been expected came out in favour of a cap. (For a sober economist’s justification of the cap, see the evidence given by Professor Martin Cave, who was the dissenting member of the original CMA panel, to the Select Committee.) The charts and table below, published (or derived from data published) on Ofgem’s website in December 2017, tell their own story. The Bill follows the text of the draft Bill closely. The table below sets out the key features of the tariff cap regime in the draft Bill and the Bill as introduced, and how the substantive changes from the draft correspond to recommendations made by the Select Committee in its report. As soon as practicable after Royal Assent, Ofgem must include conditions in electricity and gas supply licences to cap SVT and “default rates” (tariff cap conditions). The Committee favours an “absolute cap” rather than one expressed in relation to the level of suppliers’ non-SVT / default rate tariffs. The Bill remains silent on the precise form and level of the tariff, which are left to Ofgem to determine. A new provision emphasises that the cap will apply to all supply licences and contracts, whenever entered into. (e) ensure that suppliers who operate efficiently can finance their licensed activities. To deter legal challenge to Ofgem’s decisions, Government should clarify that all five objectives do not have to be satisfied at once. In particular, Government and Ofgem should minimise the risk of challenge arising from the likely short-term reduction in switching when the cap first comes into force and its (perhaps inevitable) reduction in the incentives for some customers to switch. Matter (a) is elevated to an overarching objective, in aiming to achieve which, Ofgem is to have regard to matters (b) to (e). A new sub-section provides that the cap does not include charges that are part of the SVT / default rate, but are not regularly paid by the majority of customers who pay that rate. (b) SVTs that apply only if chosen by customers and that appear to Ofgem to support the production of electricity or gas from renewable sources. No doubt partly to acknowledge the fact that there is no current “standard” for green gas tariffs in gas supply licences, Ofgem is given more time to provide for exemption (b). Starting in 2020, and for as long as the cap remains in place (see below), Ofgem must, by 31 August, annually review “whether conditions are in place for effective competition for domestic supply contracts” and report to BEIS (report to be published by 31 October each year). (b) state whether, as a result of that review, it proposes to change the level at which the cap is set. The Bill does not include any further definition of “effective competition”. It will be immediately obvious from the above summary that the Bill leaves Ofgem with the hard work of actually setting the cap and drafting the standard licence conditions that will give it effect, and balancing a number of potentially conflicting objectives as it does so. From first publication of proposed tariff cap conditions to their entry into force is likely to take at least 4 months (allowing for one month to consider feedback from the initial consultation). Consultation that takes place before the Bill receives Royal Assent is permitted. Accordingly, having the new regime in place by Winter 2018-19 looks achievable. Even with Parliamentary timetables dominated by Brexit legislation, it should not be too difficult to find the relatively short amount of time required to debate this Bill, given the broad consensus behind the cap. Will Parliament be happy to leave it to Ofgem to come up with the all-important numbers? It should: Ofgem is an independent economic regulator (whose independence from political control remains, at least for the moment, guaranteed by EU law). The potential to disrupt delivery of the cap may lie rather with the energy suppliers themselves, or anyone else who may seek to challenge Ofgem’s eventual decision on the level of the cap or other related licence provisions in the courts. Some suppliers tried to persuade the Select Committee that Ofgem’s decisions on the cap should be subject to a right of appeal to the CMA, rather than only being challengeable by way of judicial review by a court. Their representations unsurprisingly emphasised the benefits of the CMA’s expertise and faster-track procedures more than what they may have perceived as the higher threshold that has to be satisfied for a court to entertain a challenge by way of judicial review or the narrower administrative law grounds on which a court can determine that a decision that is subject to judicial review is sufficiently flawed to be struck down and remitted to the decision-maker (here Ofgem) to reconsider. In a number of ways, the legislation has been constructed so as to reduce the risk of a successful challenge: Ofgem has been given a fairly clear (if by no means simple) job to do in a particular context, and a court may well be slow to second-guess e.g. the regulator’s judgments when prioritising the competing objectives it must bear in mind when setting the tariff cap (see above). But even if JR remains the only route for a challenge in the Bill as enacted, the possibility that a challenge will be launched cannot be ruled out, since if the calculations made by the CMA and others are even half right, there is a lot of money at stake here for some suppliers. Whether or not Ofgem has to defend any of its tariff cap decisions in court, this new function is going to be a significant item of work for the regulator over at least the next two and a half – and possibly as many as five – years. This is likely to have a number of consequences. It is hard to see how Ofgem can make judgments about e.g. how “to ensure that holders of supply licences who operate efficiently are able to finance activities authorised by the licence” without potentially routinely engaging with those suppliers on the commercial costs of their businesses in a degree of detail, and level of intensity, to which they are unaccustomed as part of “business as usual” activity. Consideration of the efficient costs of operation is normally what Ofgem does in relation to the natural monopoly businesses of transmission and distribution, not the competitive business of supply (although of course, it is a founding premise of the tariff cap regime that competition is not working properly in the domestic supply sector). Inevitably, individual suppliers will assert that their businesses do not fit particular assumptions Ofgem may make: yet the legislation explicitly precludes making “different provision for different holders of supply licences”. Perhaps the only way to avoid this level of regulatory attention would be for suppliers unilaterally to follow in the direction proposed by Centrica during the course of the Select Committee’s inquiry as an alternative to a tariff cap, by not having SVTs or default tariffs; but that in itself would not be without its challenges, not least from a customer engagement perspective. The partial re-regulation of domestic tariffs is by no means the only significant regulatory development that will occur in the energy supply sector over the period when the tariff cap is in force. Government and others have been at pains to stress that changes such as the rollout of smart meters and the introduction of market-wide half-hourly settlement, that could enhance competition in energy supply markets, are not to be seen as reasons not to have the cap. Recent history suggests that the number of such obligations on suppliers only moves in one direction: up. And unlike in the case of “pass-through” costs such as network operator charges, obligations like market-wide half-hourly settlement may be inescapable, but there is likely to be plenty of scope for argument over how much they should cost suppliers to comply, against a background of reduced SVT revenues. Meanwhile, Ofgem has opened up the whole question of the place of suppliers in the regulatory architecture with a call for evidence (November 2017) on the future of supply market arrangements. Whatever happens, there is a strong chance that Ofgem’s performance, in the eyes of most politicians and the public, will be seen as overwhelmingly focused through the lens of the tariff cap and its impact on SVT customers’ bills. 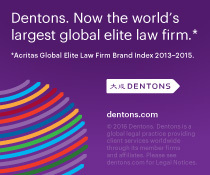 The next few years will not be easy either for the regulators or the regulated. Ofgem has published a letter setting out its timetable for developing the tariff cap condition, as well as its other ongoing work to protect vulnerable customers from overcharging. A series of working papers is promised over the next few months, with draft licence conditions being issued in August 2018 and the tariff cap being in force by the end of the year – subject to the progress of the Bill. 12 March 2018: Ofgem has published its first working paper on how it will go about setting the tariff cap, drawing heavily on earlier work in the context of the cap for the protection of vulnerable consumers. 28 March 2018: Ofgem has published its second tariff cap working paper. This deals with the possible use of a “market basket” of competitive tariffs to set or adjust the tariff cap – and provisionally concludes that such an approach is not one to follow here. 9 April 2018: Ofgem has published its third tariff cap working paper. This deals with “headroom” – i.e. “an amount above the efficient level of costs, which could be used to enable competition to co-exist with the cap”. 19 April 2018: Ofgem has published two more tariff cap working papers. The fourth working paper is concerned with how the tariff cap will take account of the economic and social policy costs faced by suppliers. The fifth working paper considers in more detail one of the reference price methodologies first outlined in the second working paper. Today Ofgem published a consultation consisting of an “overview” and 14 Appendices (altogether more than 400 pages). Ofgem explains that the consultation does not propose at what level the cap should be, but explains how it might go about setting the cap. Once the Bill has received Royal Assent, a further, statutory consultation is expected to be issued in August 2018, enabling the cap to “come into force by the end of this year so that it is place to provide protection to consumers this winter”.